Winter morning. Walking to work, perhaps disconsolately, below the railway bridge. Earlier images from this series can be found here: 1, 2, 3, 4, 5, 6, 7, 8, 9, 10, 11, 12, 13, 14, 15, 16, 17, 18, 19, 20, 21, 22, 23, 24, 25, 26, 27, 28, 29, 30, 31, 32, 33 34 35 36 37 38 39 40 41 42 43 44 45 46 47 48 49 50 51 52 53 54 55 56 57 58 59 60 61 62 63 64 65 66 67 68 69 70 71 72 73 74 75 76 77 78 79 80 81 82 83 84 85 86 87 . Each will open in a separate window. 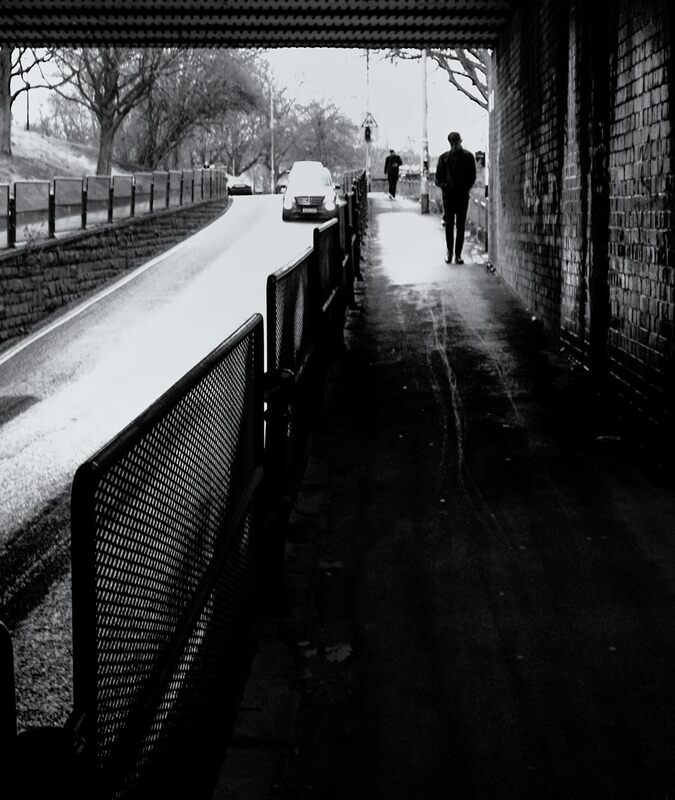 Technique: Olympus TG-5 at 40mm (equiv); 800 ISO; Lightroom, using the Camera Vivid film preset; Silver Efex Pro 2, starting at the Full Spectrum preset and adding a light Selenium tone; St Luke’s Road, south Bristol; 29 Jan 2019. Photo tells the story perfectly.